Rush'N Attack: Ex-Patriot's gratuitous gore, Cold War-era enemies, ridiculous, WWF-inspired takedowns and general knife-badassery show its Czech developers are serious about creating an homage to mid- to late-‘80s boyhood. But will their reimagining of a classic franchise end up being as essential as its premise would indicate? After watching a Konami rep play through parts of the game at last week's Gamer's Night, it was hard not to think maybe Vatra had chosen the wrong game to remake. If you grew up in the NES era, you know what I mean. Unlike classic Konami titles like Castlevania, Contra or the poorly translated port of Metal Gear, Rush'N Attack wasn't a classic. It was a decent game that you rented from the local grocery store, back when you could rent games from the grocery store. You picked it up because it had rad box art, and everyone knew that it was a game about killing Communists with a freakin' knife. But after the weekend was over and you'd stabbed some Russkies and rescued some POWs, whatever they were, you took it back to the store and forgot about it. If your parents bought it for you for Christmas, it was gone in a rummage sale the following fall, sold so you could buy Life Force, another, better Konami title. That's not to say Rush'N Attack: Ex-Patriot will be a bad game. Based on the hands-off demo, the upcoming PlayStation Network and Xbox Live Arcade title looks to be a capable, modern update in the Bionic Commando: Re-Armed vein. Armed with the first game's signature knife, you'll traverse what the Konami rep continuously referred to as "three massive environments." (Pause here and sympathize with the plight of a guy who has to play one tiny part of a PSN/XBLA game, over and over again, for one journalist after another, repeatedly answering the same five questions, most of which are variations on, "Can I play?") As you stab enemies to death, you'll be able to pick up their weapons, firing each a few times before being forced to revert back to your trusty pig sticker. During the demo, I caught a glimpse of knife combat, an assault rifle and a shoulder-mounted rocket launcher that was used to kill Rush'Ns at point-blank range, without damaging the game's hero. As in the original Rush'N Attack, your mission is one of liberation, but that's really just a footnote to the game's comic brutality. The repeated stabbings and gratuitous amounts of blood lend Ex-Patriot a level of over-the-top cartoon gore befitting a vintage Mortal Kombat game. At one point, the demo player picked up night-vision goggles, which allowed him access to a different part of the level. Despite appearances, though, I was told that Rush'N Attack: Ex-Patriot is not Metroid with a knife. It features only a "limited amount of backtracking." And even though I caught tantalizing glimpses of wall jumping, there wasn't really enough to say if Ex-Patriot owes a debt to the 8-bit Ninja Gaiden games. 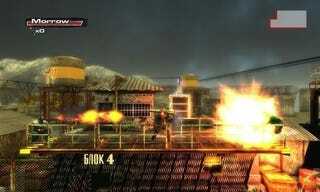 Enemies, though plentiful, appeared dumb as bricks, always firing their slow-motion pop guns in such a way so that the Konami rep could easily duck under or jump over the incoming projectile. At other times, they'd stand next to a ledge, daring those trying for a stealthy approach to pull them over. Despite these cool-sounding ways of dispatching your foes, the best thing about the reimagining isn't being able to knife enemies, or yank them over ledges. It isn't being able to duck beneath slow-moving bullets fired by tactics-disabled soldiers, or emerge unscathed after killing an enemy with a bazooka at point-blank range. It's not even the Cobra Commander-style villain that showed up in a cut scene. No, Rush'N Attack's biggest selling point is that, with its release, Konami will have crossed another game off its list, putting the storied company one game closer to the remake retro game fans of a certain age demand: A two-for-one double pack of The Goonies and The Goonies II, priced at a reasonable $15. Nothing would appeal to this child of the ‘80s more than a revival of the long-forgotten Goonies franchise. The first game never came out in North America, while the second let you kill things with a yo-yo. The movie's cult status has only grown, and the midified version of "The Goonies ‘R' Good Enough" that serves as the games' soundtrack should be a Top 10 iTunes hit in its own right. Come on, Konami, how about it? Eric Wittmershaus writes a weekly column and occasionally blogs about video games for The Press Democrat, a New York Times regional newspaper in Santa Rosa, California. You can reach him at eric [dot] wittmershaus [at] pressdemocrat [dot] com and follow him on Twitter as @gamewit.